Chandrakona is a town with a municipality in the Ghatal subdivision of Paschim Medinipur district in the state of West Bengal, India. It is a small town. This town is located between Ghatal and Garhbeta. The king – Chandraketu was the founder of the kingdom of Chandrakona. In Ain-E-Akbari it was mentioned as ‘Mana’. Chandrakona is located at 22.44°N 87.31°E﻿ / 22.44; 87.31. It has an average elevation of 28 metres (91 feet). As of 2001 India census, Chandrakona Municipality had a population of 20,400. Males constitute 51% of the population and females 49%. Chandrakona has an average literacy rate of 66%, higher than the national average of 59.5%; with male literacy of 73% and female literacy of 58%. 14% of the population is under 6 years of age. As per 2001 census, Chandrakona I CD Block had a population of 118,077 of which 60,277 were males and 57,800 were females. Chnadrakona II CD Block had a population of 106,587 out of which 54,504 were males and 52,083 were females. Growth of population in the period 1991–2001 was 13.98 for Chandrakona I and 18.85 for Chandrakona II. The headquarters of Chandrakona II Block are located at Chandrakona. Chandrakona police station has jurisdiction over Chandrakona, Khirpai and Ramjibanpur municipalities and Chandrakona I and Chandrakona II CD Blocks. The main economy is dependent on agriculture. A major sector of economy is also dependent on its tourism, since it is a historical place. Some of the main agricultural products are rice, potato and jute. Only large scale industry here is formed by about 20 cold storages of potato. A few of the percentage of the people are government employees, School Teachers and employed in other small private sectors. The financial status of most of the people is in middle class and lower middle class category. The world's largest film city, the Prayag Film City, an integrated film-making complex and one-stop entertainment destination, is scheduled to open in phases beginning in 2012. A traceable history of Chandrakona and its adjoining areas begins to emerge about 690 A.D. when the Malla Dynasty was founded at Bishnupur. It must have been at that time a prosperous place, but not much else is certain. Historically, it was turbulent times; the anarchical period known as Matsyanyaya (মাৎসানঔয়) in the history of Bengal. But tucked into the less-populated, forest covered fringes of the Chotonagpur plateau, the kingdom of Bishnupur lived by its own standards. And thanks to its excellent supply-system of agriculturally rich areas irrigated by river Shilaboti and its canals, Chandrakona grew in eminence, though gradually. Its proximity to the Puri route helped greatly, since it remained a part of Utkal or Orissa for a considerable period beginning early 13th century. The Jagannath temple had been completed only half a century ago. 17th century scholar Jagamohan Pandit,in his Sanskrit geography-text Deshavali Vivriti, described Chandrakona as an important place in Bhan Desh - a land lying between the rivers Kangsabati and Shilaboti; a rich land where quality jute grew in abundance and sustained a renowned jute-textile industry. Cotton also grew, and the cotton-textile industry was almost equally famous.Its rivers and waterbodies yielded abundant fish and sustained a large population of fishermen.We must remember that this prosperity was gained even as the Mughals and the Pathans clashed over the terrain for dominance till the former emerged victorious. The political stability required for this prosperity came Chandrakona's way as the chief of a Rajput contingent, Indraketu, established almost independent rule here in the early 15th century. At about the same time another Rajput, Gajapati Singh, assumed the rule of Bagri, lying west of Chandrakona. These two tiny kingdoms fought each other several times during the next centuries, so that their family trees and fate became inextricably entangled. Chandrakona thrived during the century-long rule of the Ketu kings. The town probably got its name from the third of them - Chandraketu. 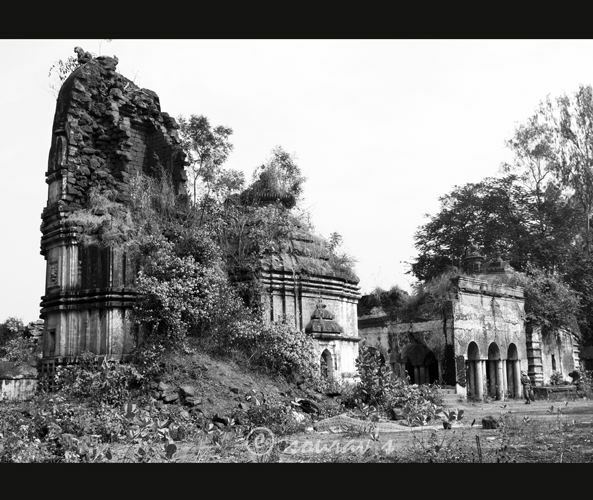 Jogesh Chandra Basu, a scholar on the history of Medinipur, says that Chandrakona was previously known as Mana. Chandraketu ruled during the early decades of the fifteenth century. The Gurudwara of Chandrakona dates from this time. Guru Nanakji and Mardanaji came to Chandrakona in 1510 on their way to Puri and set up a manji here which has now evolved into a gurudwara revered and visited by Sikhs from different parts of the state. During Mughal rule Chandrakona retained its status of a semi-independent kingdom. By the middle of the 16th century Birbhan Singh, a Chauhan, began a new line of rulers. They efficiently ruled over the town for about 150 years, till in the early eighteenth century Maharaj Kirtichandra of Burdwan overthrew Raghunath Singh, the last of them. However, most of what constitutes the glory of Chandrakona, its temple complexes and its large tanks, tell us of the interest the Bhan rulers took in public works as well as of their patronage of religion and art. The legendary prosperity of Chandrakona, a town with fifty-two market places and a network of fifty-three inter-linked roads, owed itself to the efficient administration of the Bhan rulers. Chandrakona came under the British East India Company in 1760. The textile industry was most hardly hit as a consequence. The famous weavers of Chandrakona had either to re-locate or to take up farming as profession. However, the town held its own as an important centre of trade and commerce. In the nineteenth century Chandrakona was known for producing quality brass utensils. It got its municipal administration in 1869 and Beverley's Census Report of Bengal, 1872, records that the town had a population of 21,311; that is to say, almost equal to its present population. Once a part of Hooghly district, the town was incorporated into the Ghatal subdivision of Medinipur district in 1872. Over the next six decades the population of the town depleted alarmingly. In 1931, it was reported to have a population of a little over 6000. Like its more famous neighbour Bishnupur, Chandrakona may also be termed a temple town. Its temples display the blending of several architectural styles - the Odissi Rekha-Deul, the char-chala and at-chala styles of Bengal, and so on. Some of them, like the one at Mitrasenpur, are decorated with excellent teracotta plates depicting events from the Mahabharata and the Avatars of Vishnu. The pancharatna temple of Malleswar is also a grand structure. But most of these temples have become dilapidated, and hardly any effort is being made to preserve these heritage structures. In addition to the temples, there are three Asthals i.e. monastic establishments of the Sri Vaishnava Ramanuja sampradaya hailing from the spiritual lineage of the Ahobila Mutt. The eminence of the Dharmathakur cult in Chandrakona points to the co-existence for centuries of Brahminical and non-Brahminical religions. Several Dharmathakur images are found at Gobindapur, Narahipur and Jayantipur localities of Chandrakona. The Shivagajan festival at the end of the Bengali year, one of the major religious festivals in Chandrakona, is also reminiscent of pre-Aryan rituals. Chandrakona is well connected by roads/highways to other important towns of South Bengal including Medinipur(42 km South West), Burdwan, and Bankura. State Highway 4 (West Bengal) connects the town to National Highway 6 (Kolkata-Mumbai) at Mechogram (60 km South East).The nearest railway station is Chandrakona Road, 20 km West. Locals use bicycles and motorbikes for transportation within the town. Rickshaws and cabs are also available. There are schools and colleges in Chandrakona Town. Institute of Science & Technology  is a technology oriented private college established here in 2005. This institute is affiliated to Wbut. It is an emerging engineering & management college in West Medinipur district as well as in West Bengal. There is also another college named Chandrakona Vidyasagar Mahavidyalaya which is under Vidyasagar University. The schools of Chandrakona Town are- Chandrakona Jirat High School, Kalyanshri J D Girls School, Malleswarpur Sarada Vidyapith High School and Atasi Smriti High School. There is also a non- governmental educational organization to help the poor meritorious students named Rakshabandhan For Education. Under Chandrakona Block-II, there is a village named Kiageria, 3 km from the Town. In this village, a non -conventional school called " School in the Cloud"(www.theschoolinthecloud.org/blog Chandrakona) has been organized and established by Sarbik Palli Kalyan Kendra, a 27 years old NGO, in which village children aged from 4 to 14 years old have been learning through Internet/skype of any subjects of their own without any teachers( Self Organized Learning Environment).This unique system has been introduced worldwide, by Prof Dr. Sugata Mitra, TED Talks prize winner– 2013, of New Castle University, U.K. There is a hospital in Chandrakona town. People of Chandrakona and its nearest areas mainly depend on that hospital. 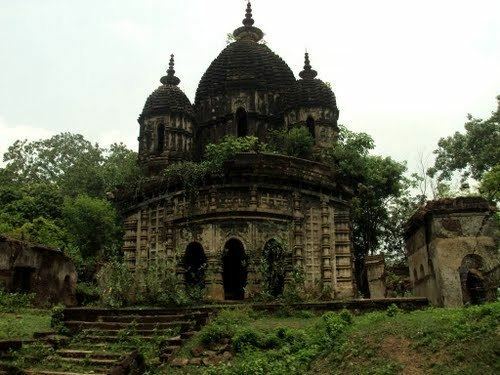 Chandrakona may also be called as a temple town. There is Pancharatna mandir, Malleswar temple. Dharma thakur pujo takes place in chandrakona and its nearest places. The regular Bengali festivals like Durga Puja, Saraswati Puja and Kali Puja are well attended. Other common pujas in the worship of Sitala, Jagaddhatri, Holi,Janmastami, Bheema Puja also takes place.